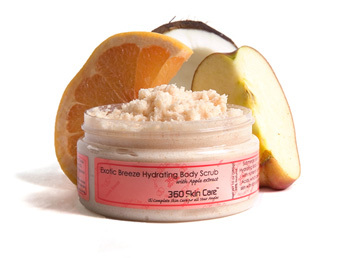 Submerge yourself in the center of an island orchard with 360 Skin Care’s Exotic Breeze Hydrating Body Scrub. Moisturize dry weather beaten skin and maintain your skin’s elasticity with nutrients found in Apple extract. Apples are also a natural source of Alpha Hydroxy Acids, which peel away old layers of dead skin and reveal fresh skin cells. Conditon your skin with rich oils to improve your skin’s appearance while restoring youth and radiance to the largest organ on your body, your skin.